Recently, structural proteomics, and more specifically crosslinking mass spectrometry (XL-MS), gained a large amount of traction as a supplemental method to protein structure techniques like electron microscopy (EM), nuclear magnetic resonance (NMR) and crystallography. 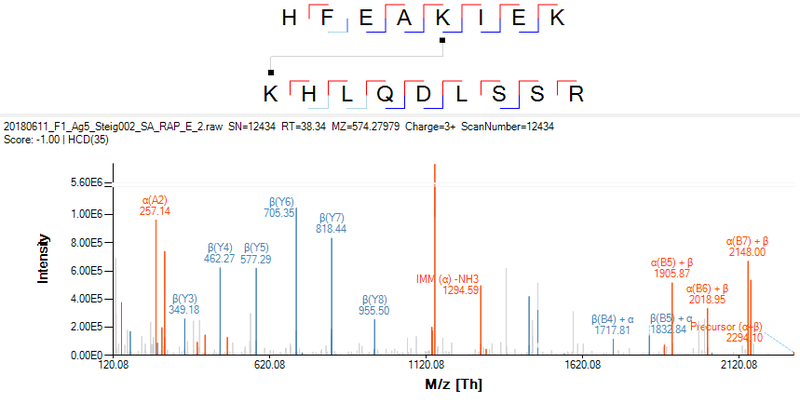 XL-MS generally provides distance constraints of lower resolution than these other techniques, but is able to pinpoint residues in close proximity to the interaction interfaces between individual subunits for protein complexes of any size in solution. Provided there are sufficient crosslinks, this technique can even allow for the detection and definition of protein interfaces. The information obtained from XL-MS experiments have in many cases been successfully leveraged to produce final protein complex models. 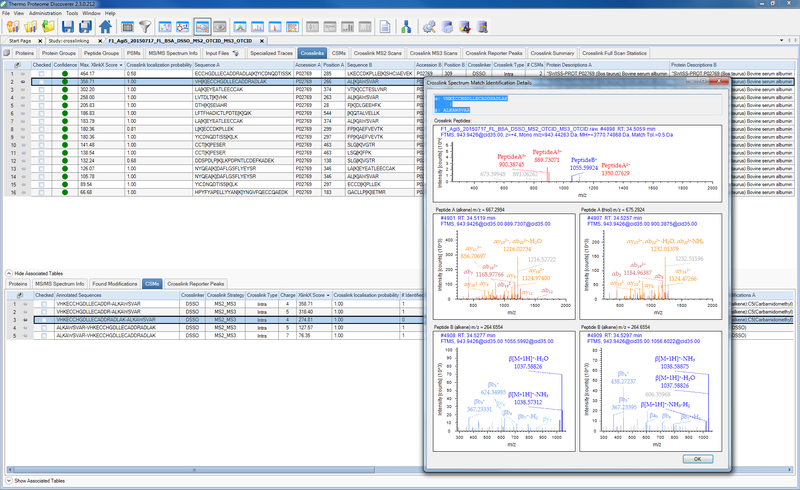 XlinkX for Proteome Discoverer (developed with support of the Proteome Discoverer development team) makes the analysis of XL-MS data easy with a user-friendly interface, highly advanced FDR control, visualization options for identified spectra and many other plots to investigate the results in detail. The software supports any linker (cleavable or non-cleavable, which can be fully defined in the general modification editor of Proteome Discoverer) and can handle any modifications (also definable in the general modification editor of Proteome Discoverer). 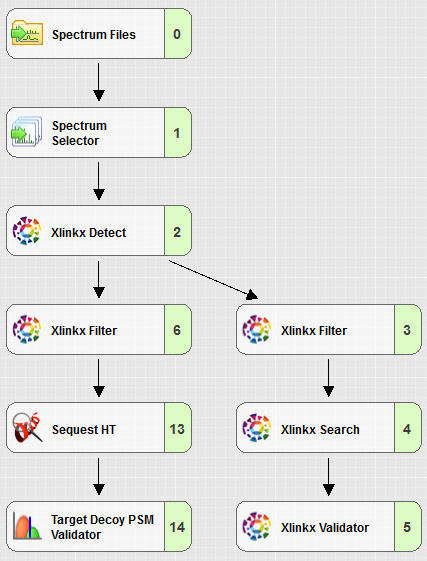 Below we supply workflows that are standard in use in our laboratory for XL-MS data analysis. For more information on acquiring xlinkx for PD, check out the Thermo Fisher Scientific webpage. 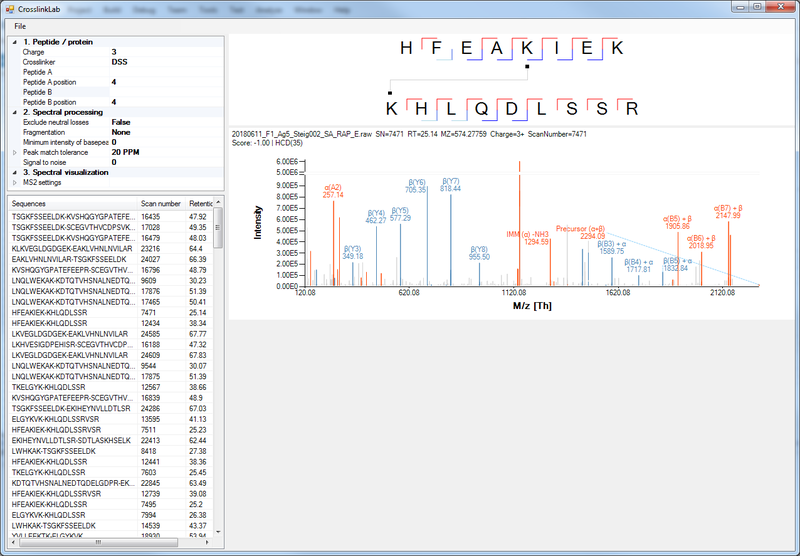 Search can be fully configures with regards to protease (definable in the PD protease editor), number of missed cleavages, minimum peptide length, maximum number of modifications allowed on one of the peptides, minimum and maximum peptide mass, precursor and fragment tolerances (Orbitrap and Ion Trap spectra are automatically treated with the required tolerance), and score filtering options. 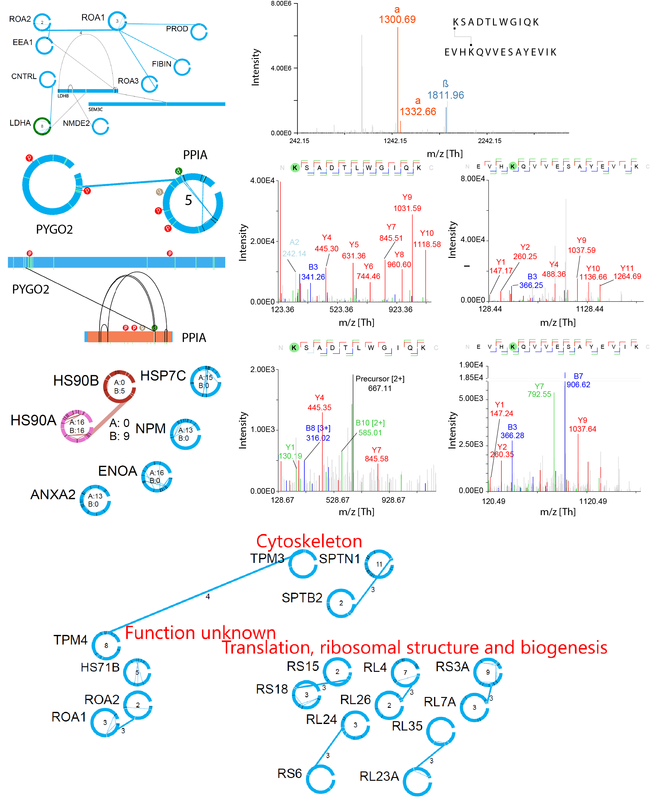 This separate tool allows you to dive into the mass spectral data behind the identifications and is able to load either raw-data directly (a convenient interface is provided to define the peptide identities) or the Proteome Discoverer output directly. The spectra can be visualized and importantly exported to PDF format to support submission to journals like MCP. This separate tool allows you to visualize the complex datasets in network format and enables filtering, clustering and drilling down into the spectral data for fast and accurate interrogation of the results.